The winner and runner-ups of World Mayor 2012 will be chosen based on the number of nominations in relation to the size of their cities and, more importantly, on the persuasiveness and conviction of testimonials received during this year's World Mayor Project. 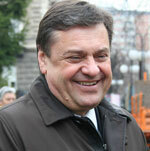 Below we publish a selection of comments received to date about WM nominee Zoran Jankovic, Mayor of Ljubljana, Slovenia. Mayor Jankovic has signed up to the City Mayors Code of Ethics. Comment: A very hands-on mayor. Sometimes referred to as a "sherrif" for his scolding of drivers that are not parked properly. Comment: I'm living in Ljubljana for 8 years and I see city changing a lot. Now we have lot more tourists, some good thing are happening in culture (art cinema, center for urban culture, museum of contemporary arts and many other things). Also, city is looking nicer, there is no traffic in main square now. Also the idea of renting bikes (BicikeLJ) is really great in my opinion. Unfortunatelly there are still some troubles with public transportation, but part of the problem is the fact that Ljubljana is small so here is no subway (and that is not easy to change, I understand). Comment: I always remember one night in our beautiful Ljubljana ... It was 11 pm; I had guests from Australia and Japan. Our Mayor Zoran Jankovic passed by, heard me explaining about our new bridge - Mesarski most and came to us. He told us so many things about Ljubljana and the new bridge that my guests couldn‚t believe, that this man is our mayor they couldn‚t believe he walks alone at night and they couldn‚t believe that somebody like him would take so much time for foreigners. Comment: Mr. Jankovic must be withdrawn from this list of mayors. He seems to violate the City Mayors' Code of Ethics, especially its Article 6. Let me tell the facts. Namely, these days he and some of his collaborators in municipal authorities and members of his family were arrested for a couple of hours by police and criminologists. Computers and documents were taken with them for the detailed investigation. It is not easy in our country to get the permission (from court) for such an investigation at homes and arrest of persons. This is therefore the proof that his supposed malfeasances are based on evidence. The investigation of his supposed breaking of several laws was started before a year and a half already under the former government. So it is not politically motivated but is very serious. All domestic and some foreign journals and weekly papers were and still are reported on details of his supposed criminal acts. He is also known as a very revengeful sort of person when you oppose him in public. Comment: I cannot believe Jankovic made it to the list. Yes, he knows how to talk a lot, but those who actually pay attention to what he is saying soon figure he is not making any sense at all, there's lots of talk but no actual content. Most importantly, he is under criminal investigation for committing forgery, abusing his position and favouring his friends in project bids. Yes, Ljubljana looks more modern now, but there are also plenty unfinished projects, plenty construction sites which have been abandoned for years and the city debts are higher than ever. Yes, he won the parliamentary elections because he knows how to appeal to the people who only care about charisma, but the fact that he was not able to form a coalition says it all. In coalition talks he refused to work with some individuals because of who their relatives are, he made promises which he rejected in his press statement immediately after the particular talk. - He divides citizens into two groups - those, who blindly support him and are therefore protected and supported by him, and those who challenge his illegal and unconstitutional acts and are therefore the target of his attempts to hinder and hamper them. - During his mayorship there has been an expansion of civil initiatives, because his projects worsen the living conditions of the residents. He does not give any consideration to the arguments of civil initiatives, does not respond to their proposals and refuses to meet with the representatives of any civil initiative. When members of one of the civil initiatives were collecting signatures in support of a proposal, as required by law, he even called signatories who he knew personally to convince them to withdraw their support. And I can prove this. - he does not care about contractors and workers who built the new stadium in Ljubljana in severe working conditions and have not received payment up to date. - The cyclists‚ path at the new Fabian's bridge is improperly built and therefore very dangerous for cyclists.